Some people don’t like to hit the gym to shed off the extra pounds, and the only best alternative way to exercise is by engaging in fun sports. One of my all-time favorite sport is the table tennis. Although table tennis is not an easy game to play, with the right equipment and playing tricks, you will be good to go. The game requires you to move around and jump in case you want to reach or get to a better position of hitting the ball. This is return accelerates your body to lose the extra pounds. 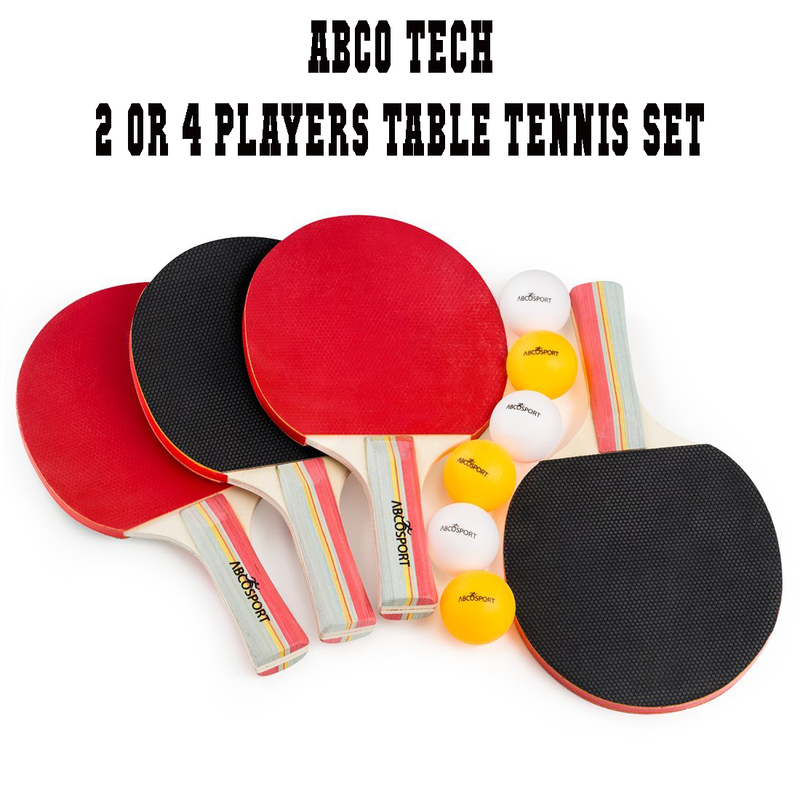 To complete and have the best gaming sessions, you require having an Abco tech 2 or 4 players table tennis set since it is the most recommended set. I started researching different table tennis sets online and was met with a lot of options. It was overwhelming at first, but I narrowed down my search to fit my price point under $25. This led me to the Abco Tech 2 or 4 Players Table Tennis Set on Amazon. The first thing that stood out to me was the fact that it was an Amazon’s Choice item related to ping pong. Right away this gave me a sense of confidence that this set was highly reviewed and came at a great value. The paddles looked nice, and I was happy to see that the set included ping pong balls. I was pleased with finding this product on Amazon and wanted to share the results of my research and why it stood out to me. When playing table tennis, the most important aspect of your paddle is its comfort. You have to hold the paddle for the entire game, so it should feel good in your hand. The Abco Tech paddles have an ergonomic grip that is wide at the base and tapers as it goes up towards the blade. This design feels natural in your hand and makes it easy to grip the paddle comfortably. The wood is sturdy and provides a good response when hitting the ball. Overall, the quality of this paddle set is very high. The five-ply blades are much thicker than cheap, wooden paddles and are also more durable. Where thin paddles will splinter and crack within a few games, the rackets in this set can withstand heavy play. The faces of the blades are covered with a rubber coating that helps you grip the ball. This coating can even help in putting the spin on your shots and take your game to a new level. Due to the quality of materials, these paddles have more weight to them compared to cheaper options. This gives the player a better feel for where the paddle is and can help with more precise strokes. The Abco Tech Table Tennis Set looks nice in the package and on the table. Black and red rubber on the blades creates a professional appearance and makes the paddles more appealing. The wooden handles connect nicely with the blade, and the transition to the rubber coating is well done. One of the most noticeable parts of these rackets is the coloration on the handle itself. Instead of a plain, natural wood, the Abco Tech rackets have blue, yellow, and red dyed handles. The colors are oriented in vertical lines, which makes the paddles very pleasing to the eye. The amazing thing about this set is the amount of value that you get in a single purchase. For under twenty-five dollars you will have a full set of professional grade paddles. Since there are four rackets included in the box, you will be able to play a game of doubles right away. In addition to the paddles, this set also comes with six high-quality ping pong balls. The balls come in white and orange, and there are three of each color. Having six balls included is nice since it is easy to lose ping pong balls during play or in between matches. Question: What is used in making the handle of the racket? Answer: The Handle is crafted with a rough wooden substance. Note That one is required to were gloves while playing the racket since it can easily cause blisters on your palms especially if you play for a long time. Question: What is the blade racket made of? Answer: The blade of the racket is made of two different materials. One side consists of rubber which makes it easy to hit and control the ball, while the other side of made of plastic the material. If you are an experienced player, it would be easy for you to use both sides but for beginners, you can learn the game with the rubber side. Q. Are these paddles made in the United States? Answer: No, they are manufactured in China. Question: Can these be used outdoors? Answer: The paddles can be used outside, but should not be allowed to get wet because this can damage the wood. The Abco Tech 2 or 4 Players Table Tennis Set is a good product at a great value. This set comes with everything needed to play a game of doubles ping pong. You receive a lot of value for the price, as four paddles and six balls are included. The paddles feel good in your hand, and I enjoy the wooden finish. The colors are really nice and look great on the rackets. When playing with the textured rubber blade, you feel more in control of your shots and spin. Overall, I believe the Abco Tech 2 or 4 Players Table Tennis Set is a great set of paddles, and I would suggest you purchase one today!